By Function – United States Flag-Ship (USFS) [Name]. Ships would also identify themselves as "the Frigate [Name]," or, simply, "Ship [Name]." The term "United States Ship" – abbreviated as the prefix U.S.S. or USS - was seen as early as the late 1790s and it was in frequent (but not exclusive) use by the last half of the 19th century. But at the beginning of the 20th century – on 8 January 1907, in fact - President Theodore Roosevelt issued Executive Order 549 and established the present usage of prefixes and eliminated all prefixes other than "USS," "USNS," "USNV," and "USRC" for ships and other military watercraft. The prefix USNS stands for “United States Naval Ship,“ and indicates a civilian-manned ship of the Military Sealift Command (or other commands). These ships are also indicated with a prefix of “T” in front of the hull number – for example, USNS Mercy T-AH-19. The prefix USNV stands for United States Naval Vessel – foreign-built, leased by the United States Navy with USN crews. The United States Lighthouse Service had used USLHT for “United States Lighthouse Tender” prior to being merged into the US Coast Guard. “United States Ship” applies to a ship only while she is in commission – the ship does not receive the USS prefix until it is commissioned – so prior to that, the ship is referred to as a Pre-Commissioning Unit, with the prefix PCU. As an example, CVN-80 (Enterprise) is scheduled to begin active construction around 2018 – at which time she would be referred to as PCU Enterprise until she is commissioned sometime in 2027. When a particular ship is declared out of active service, a prefix of “ex-” is attached in front of its name. It is done to separate the stricken vessel from any other vessel bearing the same name and in service, at that time. As an example, CVN-65 was referred to as ex-Enterprise after it accepted retirement. After decommissioning, a ship is properly referred to by name, with no prefix. Generally, the United States Navy refers to ships by name without the use of the article “the” – simply saying “Enterprise” instead of “the Enterprise.” A sole exception is in the case of (DDG-68 (and previously DD-537) – “The Sullivans” is the full name of the ship, as a tribute to the five Sullivan brothers (George, Francis, Joseph, Madison, and Albert) who lost their lives during the Second World War. 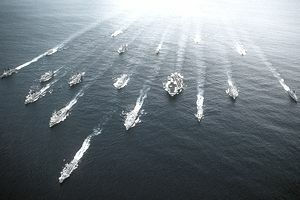 The United States Army still operates 50 vessels of five types – excluding the U.S. Army Corps of Engineers ships (such as dredge vessels) – and uses the prefix USAV for “United States Army Vessel.” In the past, other Army ship prefixes included USAS for “United States Army Ship,” USAT for “United States Army Transport” and USAHS for “United States Army Hospital Ship” – examples being USAV Spearhead, USAS American Mariner, USAT American Legion, and USAHS Shamrock. In 1957, the United States Air Force began operating a small fleet of Missile Range Instrumentation Ships to support missile test ranges, using the ship name prefix "USAF." Also used was USAFS for “United States Air Force Ship” – examples being USAF Echo & USAFS Coastal Sentry. The United States Marine Corps has no commissioned ships, relying on the United States Navy for such transportation. To be inclusive of the Uniformed Services, the National Oceanic and Atmospheric Administration uses the prefix NOAAS for “National Oceanic and Atmospheric Administration Ship” – for example, NOAAS Gordon Gunter.